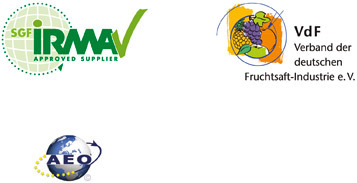 As partner of the drink- and baby food industry we have one order: to offer the best possible service to our customers. From our experience we know about the relevance of controlled processing methods – from the raw material source until the delivery. We are member of the VDF and – as well as Antigua Processors and Nkwaleni Processors – certified by the SGF. In addition, a real surety for the high-quality production of our manufacturers, is the certificate for the import of bio-organic products as per EU-Regulation 834/2007. In the result this means industrial quality at highest security standard for a worldwide market regarding fruit processing. In order to come up with our quality requirements, we are working closely together with established approved laboratories. The Klaus Böcker GmbH stands for tradition for sustainable fruit processing and is for this purpose with a worldwide net active. For the regional strength of our customers. So that also in future best quality is secured.